In the warmer months, I love to make raw porridges for breakfast. I’ve literally made so many variations that I can’t count them all. I threw this one together today, on a morning that I didn’t have a lot of hands-on time to dedicate to the kitchen. I wasn’t planning on posting the recipe, but it was so tasty that I really wanted to share it! If you’re too busy in the mornings to stand in the kitchen and make breakfast, try this porridge. Just soak the buckwheat and chia when you get up, go get ready for your day, and this porridge will be basically waiting for you when it’s time to eat. You could also soak the seeds (buckwheat is a seed, too!) the night before if you’re really in a rush. There are some ingredients in this porridge that you may not be familiar with. They can be on the expensive side, not kitchen staples for people on a shoestring budget, but I like to have a couple “fun” superfood ingredients in my pantry. I think it can be affordable if you find those few items that you really enjoy using instead of loading up on every new “super” food that gets buzz. Lucuma, a low-glycemic fruit native to Peru, is one of my favorite superfoods. I’ve never eaten a fresh lucuma fruit, but the dried, powdered form is mildly sweet and reminiscent of caramel. I use it mostly in smoothies, porridge, and sweet dips, but you can also use it in baked goods and the like. Raw coconut flour is a unique flour to work with. It’s very…thirsty. I’ve used coconut flour in raw and cooked desserts. When it’s used properly, it can create a fluffy texture that I just love. I used it in this recipe to add a hint of coconutty flavor and for its thick, fluffy texture. -1/3 cup raw buckwheat groats, soaked, drained, and rinsed well. -Pour buckwheat into a bowl and cover with water. Soak for 1-2 hours. If you’re really in a pinch, 30 minutes might do the trick. -While the buckwheat is soaking, measure out the chia in a separate, smaller bowl. Cover with 1/2 cup of almond milk. Whisk with a fork. Let it sit for around 20 minutes or until the chia seeds plump up and form a gel. Whisk again with a fork to break up any clumps. -Drain and rinse the buckwheat very well. Make sure that it doesn’t feel slimy at all. If it does, just rinse it again. 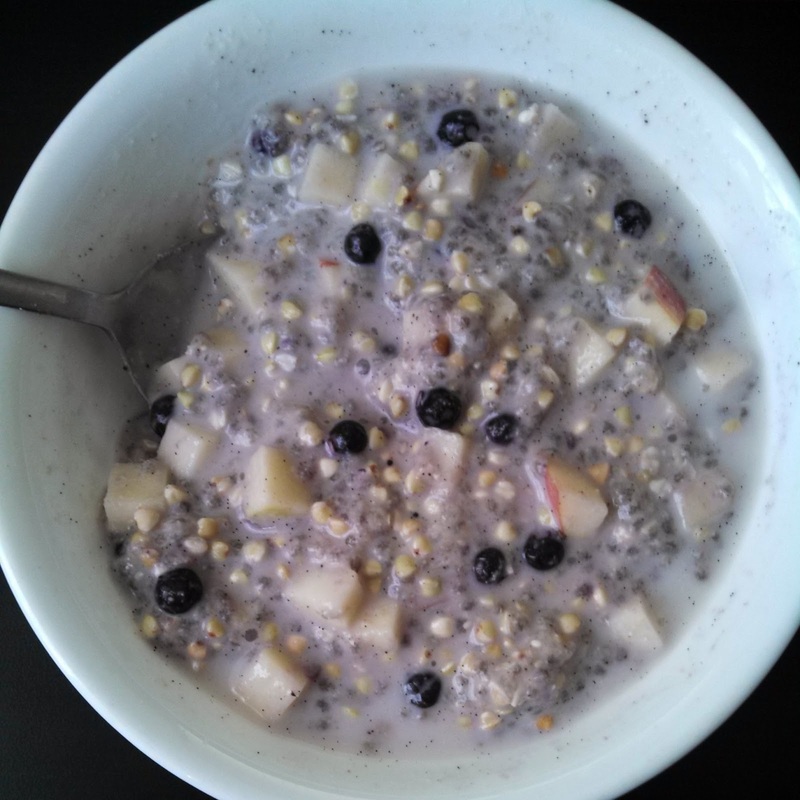 -Mix the buckwheat and chia together along with the rest of the ingredients. Stir until all is evenly incorporated. -Pour 1/2 cup of milk over the porridge. If you like your porridge super thick, use less. If you like it runnier, use more milk.